THE WOMAN WHOSE sexual assault allegation threatens to bring down President Donald Trump’s Supreme Court nominee has agreed to testify before a Senate committee on Thursday. “We committed to moving forward with an open hearing on Thursday September 27 at 10am. “Despite actual threats to her safety and her life, Dr Ford believes it is important for Senators to hear directly from her,” a statement from Christine Blasey Ford’s lawyers notes. Her decision followed days of negotiations and came after Trump turned against her and said her accusation against Judge Brett Kavanaugh could not be true. After the Senate Judiciary Committee received a message from Ford’s lawyers, several members confirmed she had accepted their committee’s request to testify. “Dr Blasey Ford will testify next week. She has shown tremendous courage in the face of death threats and harassment and deserves respect as final details for the hearing are worked out,” Democratic Senator Dianne Feinstein tweeted. Dr. Blasey Ford has accepted the invitation to testify next week despite being bullied and so far denied a nonpartisan FBI investigation that would ensure senators have the relevant facts they need. She has operated in good faith throughout this process. Let her testify. The committee’s Republican leader Chuck Grassley had wanted the hearing to take place on Wednesday, but Ford asked that it be held on Thursday at the earliest and to be able to call as a witness a man she says was present during the assault. The deal capped a day of frenetic developments, with time running out for Trump to get his hand-picked conservative judge confirmed – thereby tilting the Supreme Court firmly to the right for years to come – before November elections when Republicans risk losing control of Congress. Earlier, the panel had given the California professor until today to decide whether to appear, after she rejected a Friday evening deadline imposed by Grassley. “Although many aspects of the proposal you provided via email, on (Friday) are fundamentally inconsistent with the committee’s promise of a fair, impartial investigation into her allegations, and we are disappointed with the leaks and the bullying that have tainted the process, we are hopeful that we can reach agreement on details,” read the lawyers’ letter cited by The Washington Post. The White House later also pushed back on Ford’s claims. “One week ago, Dr Christine Ford claimed she was assaulted at a house party attended by four others. 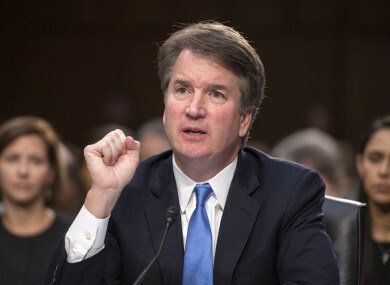 Since then, all four of these individuals have provided statements to the Senate Judiciary Committee denying any knowledge of the incident or even having attended such a party,” White House spokesperson Kerri Kupec said. “TAKE THE VOTE!” Trump tweeted, blaming “radical left wing politicians” for the controversy. According to Trump, the fact that Ford remained silent until now shows the incident probably never happened — even if this runs counter to what experts say is the typical reaction of sexual assault victims afraid or too embarrassed to report. Trump’s outburst saw a new #MeToo era hashtag storm the internet, with people – mostly women – sharing why they did not report being assaulted under the Twitter hashtag #WhyIDidntReport. Ford told the Post she went public with her claims because she felt her “civic responsibility” was “outweighing my anguish and terror about retaliation” after the basic outlines of the story emerged in the media. Republicans are frustrated over what they say was the deliberate timing of the last-minute revelation of Ford’s allegation, accusing Democrats of seeking to prevent the process from finishing before the midterm elections in a few weeks. Email “Woman who accused Brett Kavanaugh of sexual assault to testify on Thursday”. Feedback on “Woman who accused Brett Kavanaugh of sexual assault to testify on Thursday”.